Is the Sugar in Bananas Bad for You? If you avoid bananas because of their sugar content, think again. You're passing up a healthy snack that provides numerous vitamins and minerals, including fiber, potassium and vitamin C. When health organizations, such as the American Heart Association, recommend cutting back on sugar, they're talking about added sugars — not the naturally occurring sugars found in fruits. The sugar in a banana isn't bad for you. 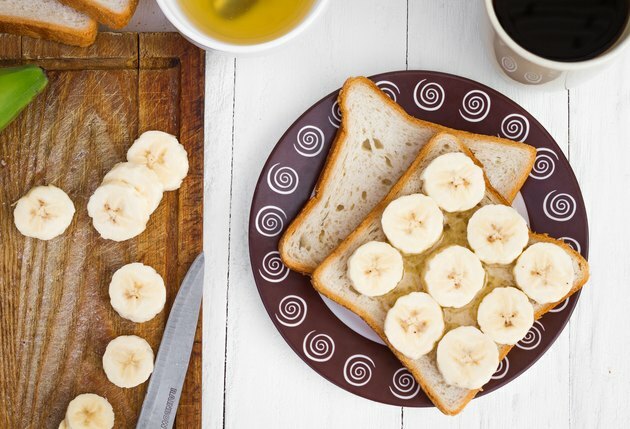 Unlike foods with added sugars, such as soda and cookies, bananas are filled with nutrients your body needs for good health, including fiber, potassium and B vitamins. A medium banana, measuring 7 to 7 7/8 inches long and weighing 118 grams, contains 14 grams of sugar. This amounts to about 53 percent of its total 105 calories. The sugar in bananas is primarily naturally occurring fructose, although glucose, sucrose and maltose are also present. Pure fructose added to products can cause elevated triglycerides when eaten in excess. However, when fructose occurs naturally — as in bananas — and comes with a bundle of nutrients and fiber, it's unlikely to cause problems. Read more: Is the Sugar in Fruit Bad for You? Americans consume about 17 teaspoons of added sugar per day, according to the University of California at San Francisco. These added sugars pad your diet with extra calories, which can cause weight gain and nutritional deficiencies as they replace more nutritious foods. Added sugars may also play a role in high blood pressure, elevated triglycerides and inflammation that leaves you vulnerable to disease. For some people, these added sugars trigger mechanisms in the brain that cause you to crave more. Added sugars are those not naturally found in foods. High-fructose corn syrup in bread, cane sugar in yogurt and honey in cereal are all examples of added sugars. Processed foods with added sugar usually have more sugar than whole, unprocessed foods and tend to be lower in nutritional value. The American Heart Association encourages you to limit your intake of added sugars to just 100 calories per day or 6 teaspoons if you're a woman and 150 calories or 9 teaspoons if you're a man. The sugar in bananas comes with a quality nutrition package. In one medium banana, you get more than 3 grams of fiber, 10 percent of the daily recommended value for a 2,000-calorie diet. Fiber helps with proper digestion and can lower your cholesterol. A medium banana also provides 10 milligrams of vitamin C, an antioxidant critical to tissue repair and immunity, as well as vitamin B6, intrinsic to energy production and metabolism, and folate, for healthy blood cells and the prevention of neural tube defects in a growing fetus. Bananas are a high-potassium food too, with more than 420 milligrams per medium banana — nearly 10 percent of your daily recommended value. Potassium helps keep your minerals and fluids balanced, promoting a regular heartbeat and muscle function. Bananas also contain magnesium, manganese and small amounts of iron, all of which are needed for basic biological functions. Read more: How Much Natural Sugar Should You Consume Daily? University of California at San Francisco: SugarScience: How Much Is Too Much?